All Posts Tagged With: "Fresh"
Go Black Friday Fab…Only at Sephora! Now that you’ve satisfied your tummy with hearty eats, it’s time to satisfy your craving for beauty! Beat the crowds this Black Friday and make Sephora your first shop stop for true holiday magic. From adorable stocking stuffers, to larger than life makeup sets and fragrance kits, Sephora is offering sweet steals and deals you and your wallet won’t want to miss! 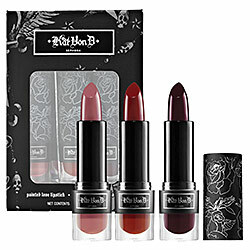 · Kat Von D Painted Love Lipstick Gift Set ($34, $54 Value!) – This trio of rich, full-color lipsticks is perfect for creating a smoldering, sultry holiday look. NEW! LIMITED EDITION! Watch: Follow Marta Walsh founder and editor of Talking Makeup.com and the rest of the Daily Makeover Beauty Bloggerati through the beauty boutiques of New York City. The bloggers hit Kiehl’s, L’Occitane, Lancôme, Fresh, and Space NK. Fresh Brown Sugar Body Polish is a body scrub made with real sugar crystals soaked with soothing natural oils. 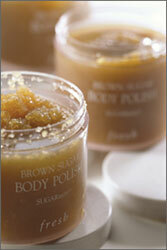 Fresh Brown Sugar Body Polish gently exfoliates your skin making it softer and more radiant. Ingredients include: evening primrose, sweet almond oil, citrus oils, apricot kernel and jojoba oils, anti-inflammatory arnica and calendula, ginseng, peppermint, passionflower and white lily. Cost: $62.50. Fresh Cotton Shampoo is an hydrating and volumizing shampoo. Fresh Cotton Shampoo contains ingredients like: cotton powder, cotton seed oil, Moringa extract, sunflower extract, and camellia. What you get is hair full of volume, good condition, and tamed flyaways. Safe even for color-treated hair. Cost: $26. Long full lashes 60’s style are back in. And there is not a better way to achieve this look then stocking up with Supernova Mascara from Fresh. Lev Glazman and Alina Roytberg are the geniuses who came up with this Fresh idea. It all started when they couldn’t find the perfect soap to sell in their apothecary-style beauty shop in Boston. They realized they were on to something. Perfect soap means a soap bar that not only smells and looks good but actually works. Bar soaps were their first love but they then expanded into skincare, makeup, fragrance, home, hair, and body care. Supernova Mascara by Fresh was first seen in InStyle Magazine on January 2005 issue. This extra special mascara will give you the dramatic, glamorous lashes you always dreamt about in just one coat. More good reasons to buy this mascara are as follows: it comes with a unique mascara wand to optimize application and desired coverage, it is enriched with nourishing meadowfoam seed oil and strengthening linden bud extract to fortify lashes. And lastly, it is ophthalmologist tested. Comes in Black shade and Costs: $25.